Guyu, or Grain Rain, is the last solar term for spring, when early crops pop up with their shoots after frequent rains. Though there are annoying catkins in the air and insects in the fields, it is also the time of beautiful sceneries as flowers bloom and tasty and healthy teas are served. Grain Rain usually occurs on April 20 or April 21 when the sun’s elliptical longitude reaches 30 degrees, and rain and rising temperature ensure healthy bunch of crop. This year it will fall next Thursday. The temperature in most Chinese regions surpasses 20 degrees Celsius after the onset of the day. The arrival of the Grain Rain signals a period of “three waitings” — waiting for duckweeds to grow, waiting for cuckoos to flap their wings, and waiting for the Eurasian hoopoe to land on the mulberries. Apart from appreciating beautiful flowers and tasty cherries, people in most regions may have to put up with willow and poplar catkins after Grain Rain. People suffering from allergies need to take precautions. More frequent rains may also bring annoying insects in the season. Some dampness-dispelling food in traditional Chinese medicine concept may help people adapt to weather more smoothly. That includes eel, tofu and duck’s eggs. It is widely accepted that the name of guyu came from the term of yu sheng bai gu, which literally means “rain giving birth to hundreds of grains.” Yet, legends seem to suggest that there were actually a rain of grains on Grain Rain thousands of years ago. According to “Huai Nan Zi,” a philosophical book in Western Han Dynasty (206 BC-AD 24), a rain of grains actually happened during the reign of the Yellow Emperor. It was god’s appreciation of Cang Jie, who created the first characters for written Chinese language. Temple fairs to commemorate his great contribution are a regular feature during Grain Rain in Cang’s hometown in Baishui County, Shaanxi Province. There are different tasks to be carried out in different regions during Grain Rain. As sea water warms up, plenty of fish cross over to the shallow part of the sea, ensuring a boom time for fishing. Therefore, fishermen in Shandong Province pray to Sea God for protection before setting off for their catch. They offer sacrifices either at the Sea God Temple or directly in the sea, with their set rituals. The warm temperature after Grain Rain also leads to quick reproduction of insects. Killing insects in the field and placing insect-dispelling pictures in the villages during Grain Rain are part of the customs in Shandong, Shanxi and Shaanxi provinces. The Taoist feature is called guyu tie (Grain Rain Picture). It often features paintings of magic chicken killing scorpions or Taoist master dispelling five evil insects together with magic words, as a wish for good year without insects. 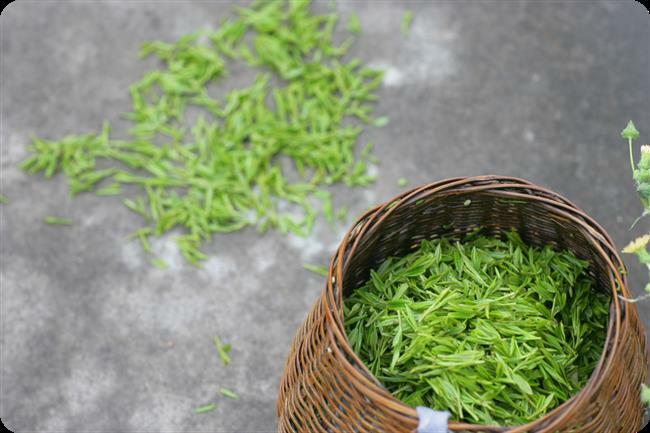 Picking fresh green tea leaves during Grain Rain is a popular activity in southern China. The tea leaves picked around Grain Rain is usually fresh in color, gentle in texture, rich in fragrance and vitamins. They are called guyu cha, or Grain Rain tea. The genuine such tea is picked on the morning of Grain Rain. Traditionally, farmers keep the early tea for themselves or for distinguished guests rather than sell them, as it is believed that tea collected on that day can protect people from all kinds of diseases. One sprout together with one leaf, and another with two leaves are two common types of guyu tea leaves. The sprout with one leaf is called qiqiang, or flag spear due to its appearance; the sprout with two leaves is called queshe, or sparrow’s tongue. Though not as fresh and gentle as mingqian cha (tea collected and processed before Qingming Festival), guyu tea is preferred for its stronger taste, good presentation in water, and most importantly, much lower price. Generally, the price of green tea keeps dropping after Qingming Festival, or the tomb-sweeping day, and becomes affordable for ordinary people around Grain Rain. The guyu tea were sold at around 600 yuan (US$86.95) per kilogram at online shops last year.